Even more pure awesomeness. The Amiga community is without a doubt the most active and knowledgeable in the retro scene. We've already reported about this project - and, yeah, it's done, thanks to Paul and the community! The GoFundMe campaign has reached and even exceeded the amount of money required, and Paul Rezendes was pretty quick at getting the first boards produced and tested. By now the files created have been released to the public, and you can even order a board from Paul. Another fantastic addition to the range of newly available Amiga parts. Now there's no excuse not to resurrect your battery-leakage-damaged Amiga 4000 from the attic! ...and arananet's Amiga 4000 daughterboard! 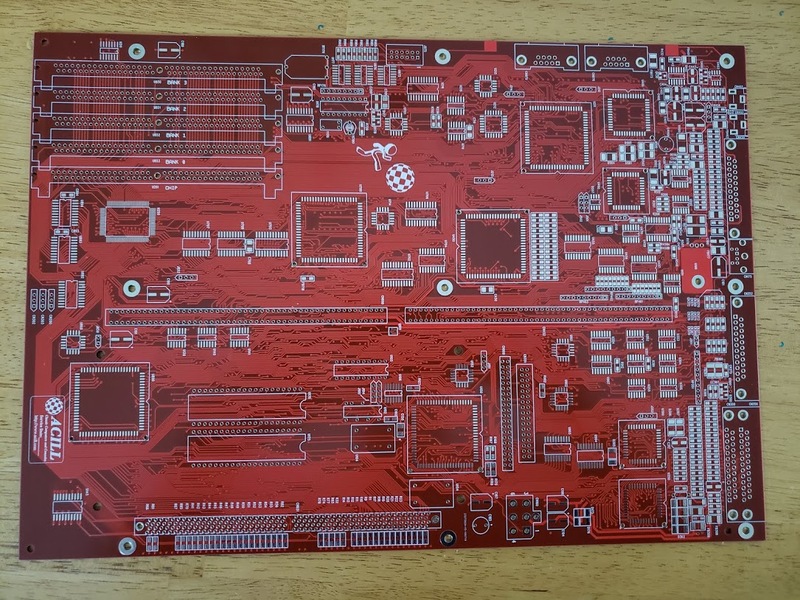 With the Amiga 4000 replica mainboard done (see above), and John Hertell's A3660 Amiga 4000 CPU board done, you might be wondering "cool, but I still can't build my Amiga 4000 without a ..."
Eduardo Luis Arana has published the files required to build a updated daughterboard. The ISA ports has been removed, and it now includes a 15KHz VGA display connector to use with a breakout / backplate bracket. And it has some nice fiery design on the backside. The Amiga's video connectivity features, while being highly convenient about 25 years ago, have turned out to be somewhat problematic today, and every update to them is warmly received. 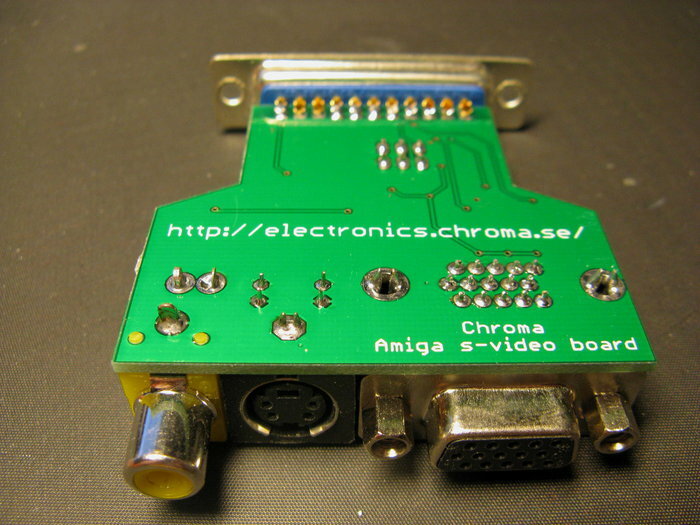 This board connects the any Amiga's 23-pin display output, and has a composite video, an S-video, and a 15KHz VGA output connector. Picture quality is claimed to be higher than Amiga-built-in outputs, especially using the S-video output. 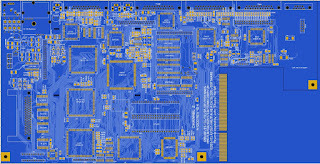 Derived from Stephen Leary's TF328 project by Kipper2k, and further developed by Solidcore and Mike Stirling, these are two similar expansion boards for the Amiga 1200. The situation with these boards is a bit unclear, no conclusive information about final development and availability could be found. It looks as if currently only the software for the cards (drivers and firmware) has been released to the public. A nice little addition for your quick harddrive needs might be this straightforward Amiga 500 harddisk interface. It requires a floppy disk to boot from and has been successfully tested with Kickstart 1.3 and 2.0. As you can see in the picture below, it has two expansion port connectors, one after another - the front one is an adapter to standard 2.54mm pin grid connector, and the other one is the pin grid connector mounted to the PCB. As the author says in the README file: "[...] future expansions will be developed with pin headers as their main connector." Huge sigh of relief. Finally someone starts to get rid of proprietary, hard-to-obtain connectors, and replaces them with widely available, future-safe solutions. One small step for an expansion board, hopefully one giant leap for Amiga-kind. As of now the latest commit to the GitHub repository happened just 11 days ago, so this is apparently under active development. 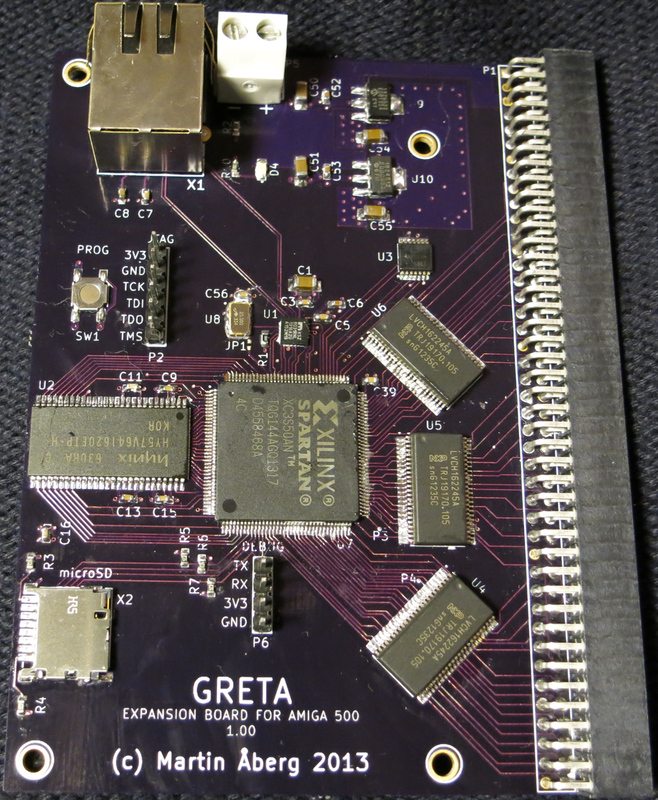 A couple of years ago, Martin "endofexclusive" Åberg from Sweden created GRETA, a Xilinx Spartan FPGA-based expansion board for Amiga 500. It's build to add 8MB SRAM, a microSD slot, and 10/100MBit ethernet controller to the Amiga. The project files have last been updated on August 1st 2016, and hardware programming is still incomplete - currently only RAM expansion is supported. GRETA seems to be some kind of forgotten gem among Amiga hardware expansions - the specifications look fantastic, it contains all of the features one would like to have on a single PCB. As it seems, there's only some programming required to make things work. Wouldn't that be a nice project to pick up and give it some love? Looking at the other amazing expansion boards that have come out in recent years, probably even an unexperienced programmer would be able to add ethernet and microSD mass storage support to the device, there's plenty of material out there to study and learn from. This part 2 of this article - have you read part 1? If you spot an error please report by leaving a comment below. It sounds too good to be true, but in these cases it isn't a hoax. There is a lot, and may I repeat, A LOT going on in Amiga hardware world... In fact it's so much I've split this into two parts. On April 24th 2018, 7-bit Retro Electronics announced a new product: The "SPI MasterBus CP" controller for the clockport. SPI is a simple, flexible, fast serial data interface that allows multiple devices to be connected. It's used by numerous types of devices across all computer platforms, e.g. as an interface to memory card readers (SD, SDHC, CompactFlash, ...), ethernet controllers, flash memory, for CPLD programming, and many more applications. That makes a fantastic addition to the Amiga's capabilities! Built-in software will allow you to manage several characteristics of the controller. With increasing age, Amiga 1200 mainboards (among others) run the risk of taking damage from leaking capacitors, and of course over a timespan of about 30 years there are a lot of other factors that may shorten - or quickly end - a mainboards life. Wouldn't it be nice to just have the opportunity to purchase or make a new one? 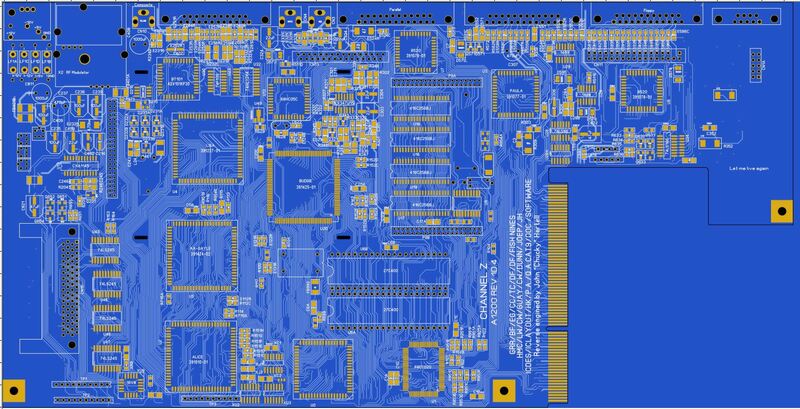 This is one of two projects (see below for the other one) recreating the Amiga 1200 mainboard, Jeroen's "Amiga 1200+" is an updated version with some changes. The project is covered by Creative Commons license, and you are free to build your own mainboard! Gayle, Budgie and the DRAM have been removed and the functionality has been moved to a daughterboard. This board can also contain a CPU. Video output has been moved to a seperate output board. This board get all Lisa output signals and also all the typical Zorro signals. This means that an RTG card can be developed. The PCMCIA slot has been removed and in the free space a power switch, boot selector switch (DF0:/DF1:) and a uSD card slot have been added. Two PC standard 3 Pin fan headers are added to the board. The "Terrible Fire compatible SPI port" is an especially nice addition: it shows that Amigans work together - way to go! 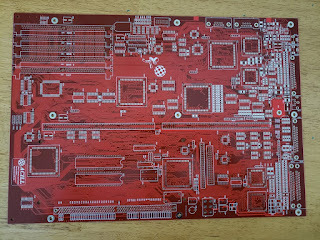 The other project recreating the Amiga 1200 mainboard comes from John "Chucky" Hertell, well known Amiga hardware guru. He had already created the A3660 Amiga 4000 replacement CPU module (see http://wordpress.hertell.nu/?p=537 and http://eab.abime.net/showthread.php?t=89200 if you want to know more), and asked the community for his next reverse-engineering project, which turned out to be the Amiga 1200 mainboard. Well, about two months later, and with the help of other members of the Amiga community, Mr. Hertell had a clone of the original 1D4 version mainboard in Gerber file format! Well, what can you say - another awesome job by Mr. Hertell. Note that you can also buy ReAmiga 1200 PCBs from Mr. Hertell - income from these sales will partly be donated to Swedish children cancer fund. See link above. Both Matthias 'Matze' Heinrichs' and Christian 'Scrat' Euler have recreated a legend: an AGA-chipset equipped Amiga 3000! Sadly, there's no open source re-creation (yet?) of the mainboard, probably due to technical difficulties (8-layer board) - but nontheless, this is another great example of the capabilities of the Amiga community. Who would've thought we'd see these ultra-rare machines outside of Commodore's laboratories one day? click here to read part 2 with more amazing Amiga hardware news!